Nishith, N., Monappa, V., Kudva, R. (2018). Fallopian Tube Carcinoma In-situ in Endometrial Curettage. 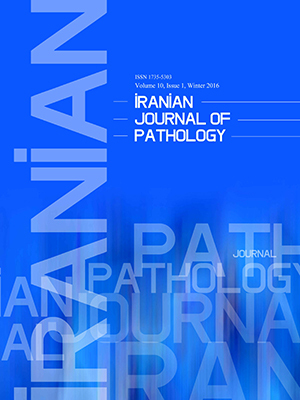 Iranian Journal of Pathology, 13(3), 363-367. Nilay Nishith; Vidya Monappa; Ranjini Kudva. "Fallopian Tube Carcinoma In-situ in Endometrial Curettage". Iranian Journal of Pathology, 13, 3, 2018, 363-367. Nishith, N., Monappa, V., Kudva, R. (2018). 'Fallopian Tube Carcinoma In-situ in Endometrial Curettage', Iranian Journal of Pathology, 13(3), pp. 363-367. Nishith, N., Monappa, V., Kudva, R. Fallopian Tube Carcinoma In-situ in Endometrial Curettage. Iranian Journal of Pathology, 2018; 13(3): 363-367. Background and Objective: Primary fallopian tube carcinomas (PFTC) are rare tumors with non-specific clinical presentations. The current case was unique since the tumor was first detected on endometrial curettage and clinicoradiologically was misdiagnosed as endometrial carcinoma. Case Report: A 48-year-old, post-menopausal female presented with one episode of vaginal bleeding. Endometrial curettage showed poorly differentiated carcinoma, while cervico-vaginal Papanicolaou (Pap) smear was negative for malignant cells. Right sided fallopian tube carcinoma in-situ was diagnosed on histopathological examination of surgical hysterectomy with B/L salpingo-oophorectomy specimen. Conclusion: As observed in the current case, unusual tumor histology with broad papillary fronds lined by pleomorphic cells showing nuclear stratification and focal involvement of endometrial curettage specimen may be considered a useful pointer for tubal malignancy.